"Simple living"—as it applies to the philosophy and practice of Krishna consciousness—can mean many things, such as freedom from greed and extravagance, straightforwardness in social dealings, exclusive service to the Supreme Person, honest work in harmony with natural laws, and dependence on God's mercy. Srila Prabhupada may have had this poem in mind when he frequently used the term "simple living and high thinking" to describe the ideal way of life for people in general and devotees of Krishna specifically. "Simple living" is rooted in the idea that an intelligent person should spend as much time as possible cultivating spiritual awareness and not get carried away by material circumstances or desires. Simple living requires minimizing bodily needs and accepting whatever comes by the arrangement of Providence. To this end, Srila Prabhupada always spoke in favor of local self-sustaining agrarian economies to meet life's needs without the hard labor needed to acquire extraneous amenities. In the Bhagavad-gita, Krishna describes the ideal social system for simple living—varnashrama-dharma. In that model, people work according to their nature, for the common good, with the consciousness that everything belongs to the Supreme Person and life is meant for serving Him. Most of us don't live an agrarian life, and varnashrama-dharma is not the current world model for civilization. It is therefore our responsibility to apply varnashrama principles in our own lives by seeking guidance from scripture and spiritually advanced persons. The process is indeed simple, but the application is likely to keep us fully and prayerfully busy during this lifetime. Simple living essentially means living to please God. Individual applications of this principle may differ, but basically we're recommended to accept whatever's favorable for our spiritual progress and to reject whatever's unfavorable. Perhaps it's not so simple to live simply in this day and age, but if it weren't possible at all, it wouldn't be so highly recommended. *In this context, the word "homely" means "unsophisticated and unpretentious," qualities even more rare now than in 1802, when Wordsworth wrote it. - Get rid of lust and greed, and you solve all the world's economic problems. - The whole world situation is degrading because people are not producing their own food. This is the problem, the real problem. - "Anyway, learn to love this natural mode of life, life in a wide-open space. Produce your own grain. Produce your own milk. Save time. Chant Hare Krishna." How Green is your Tractor? - Many of the ideas of the Green movement seem to fit well with Krishna consciousness. - Unless we learn to live here peacefully, we will not be able to pursue spiritual life. "A devotee should not live very gorgeously and imitate a materialistic person. Plain living and high thinking are recommended for a devotee. He should accept only so much as he needs to keep the material body fit for the execution of devotional service. He should not eat or sleep more than is required. Simply eating for living, and not living for eating, and sleeping only six to seven hours a day are principles to be followed by devotees." "The Vedic philosophy teaches that the top priority in life should be reawakening our relationship with the Lord. Therefore a sensible man should never allow himself to get so wrapped up in his material duties that they sap all his energy and kill his desire for serving Krishna. Srila Bhaktivinoda Thakura, who was both a great Vaishnava and a responsible magistrate in the Indian government, said that we should balance our material and spiritual needs, but that we should favor the latter. In other words, we should earn our livelihood in the spirit of simple living and high thinking." "When everyone is working in the city to produce nuts and bolts, who will produce food grains? Simple living and high thinking is the solution to economic problems. 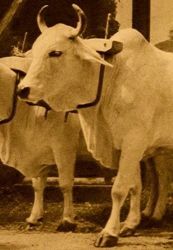 Therefore the Krishna consciousness movement in engaging devotees in producing their own food and living self-sufficiently so that rascals may see how one can live very peacefully, eat the food grains one has grown oneself, drink milk, and chant Hare Krishna." "According to the three modes of material nature and the work associated with them, the four divisions of human society are created by Me. . ."
"Everything animate or inanimate that is within the universe is controlled and owned by the Lord. One should therefore accept only those things necessary for himself, which are set aside as his quota, and one should not accept other things, knowing well to whom they belong." "One's devotional service is spoiled when he becomes too entangled in the following six activities: (1) eating more than necessary or collecting more funds than required; (2) overendeavoring for mundane things that are very difficult to obtain; (3) talking unnecessarily about mundane subject matters; (4) Practicing the scriptural rules and regulations only for the sake of following them and not for the sake of spiritual advancement, or rejecting the rules and regulations of the scriptures and working independently or whimsically; (5) associating with worldly-minded persons who are not interested in Krishna consciousness; and (6) being greedy for mundane achievements." "There are six principles favorable to the execution of pure devotional service: (1) being enthusiastic, (2) endeavoring with confidence, (3) being patient, (4) acting according to regulative principles [such as sravanam kirtanam vishnoh smaranam [SB 7.5.23]—hearing, chanting and remembering Krishna], (5) abandoning the association of nondevotees, and (6) following in the footsteps of the previous acharyas. These six principles undoubtedly assure the complete success of pure devotional service." - a sustainable recycling system and organic farm amid unemployment, desert soil, drought and extreme weather conditions.